The Marina Bay street circuit of the Singapore Formula One Grand Prix is seen illuminated at dusk. Marina Bay Sands was officially opened in June by the CEO of the Las Vegas Sands group Sheldon Adelson. The site features three hotel towers, a unique 'Skypark' across its top designed by architect Moshe Safdie, convention and shopping centres, and a casino which opened to the public in April. 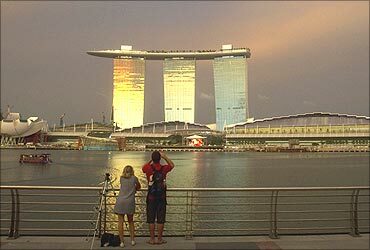 Image: Tourists stand at a promenade across the water from the Marina Bay Sands. 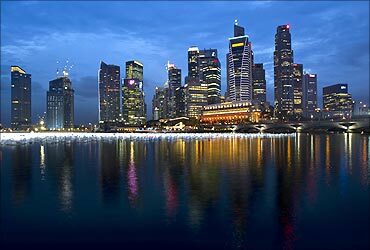 Singapore has topped a list of the best cities in Asia for Asians to live, a location ranking survey conducted by ECA International. Undertaken annually, the survey compares living standards in 254 locations globally. 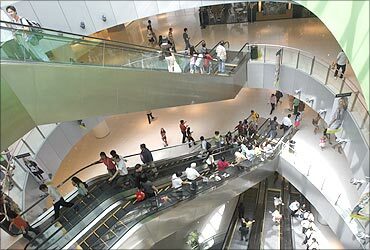 Image: Shoppers use escalators at a shopping centre in Singapore. Singapore open its first casino in February, coinciding with the start of the Chinese New Year, as the city-state makes the latest roll of the dice to turn itself into a playground for the rich. 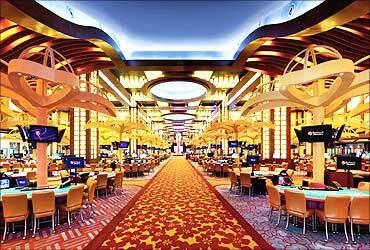 Image: Interior of the Resorts World Sentosa casino on Singapore's Sentosa Island. The park features a variety of attractions including roller coasters and pyrotechnic shows. It is part of the Resorts World Sentosa development, which includes a casino and four hotels in addition to the theme park on Singapore's Sentosa Island. 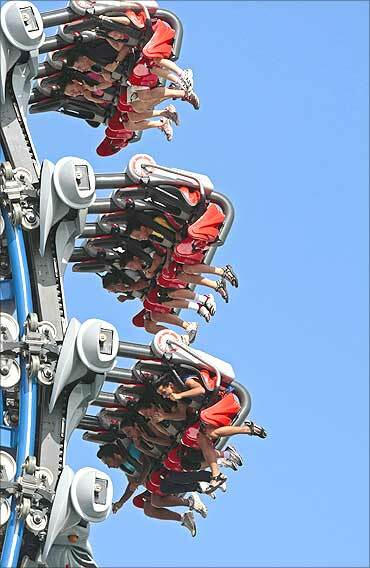 Image: Visitors ride the Battlestar Galactica dueling roller coaster at the Universal Studios theme park in Singapore. Singapore's central business district at dusk. The Sands Skypark features a 150-metre infinity pool overlooking Singapore's city skyline and Marina Bay, a public observation deck and a restaurant run by a celebrity chef. 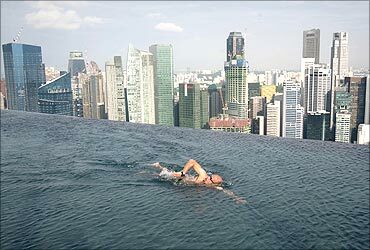 Image: A guest swims in the infinity pool of the Skypark that tops the Marina Bay Sands hotel towers in Singapore. Las Vegas Sands, the world's most valuable gaming company, opened the doors to its multi-billion-dollar Singapore casino this year, the latest entrant in the fight for Asia's gambling dollar. 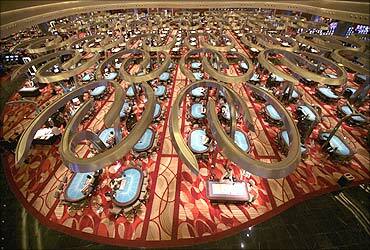 Image: The main gambling floor of the Marina Bay Sands casino in Singapore. The Earth is literally covered in water, but more than a billion people lack access to clean water for drinking or sanitation as most water is salty or dirty. 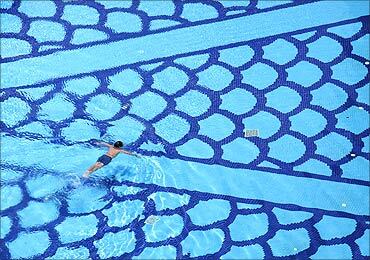 Image: A man swims in a pool inside a condominium in Singapore. 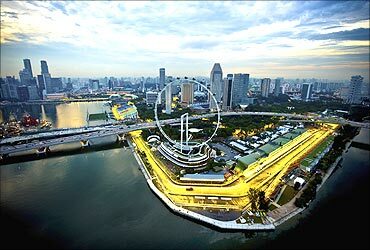 The Singapore F1 Grand Prix tookm place from September 24 to 26. Picture taken with a fish-eye lens. 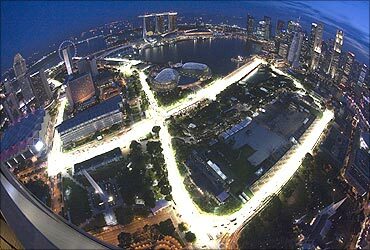 Image: An aerial view shows the illuminated Marina Bay street circuit of the Singapore Formula One Grand Prix. Luxury boat makers are trying to survive the global financial storm by slashing prices and creating bargains for millionaires looking to play off Asia's coastlines. The mood at the Boat Asia show in Singapore, which calls itself Asia's leading leisure boat and waterfront lifestyle event, was fairly dour, in stark contrast to advertisements that showed models drinking champagne on sleek white speedboats. 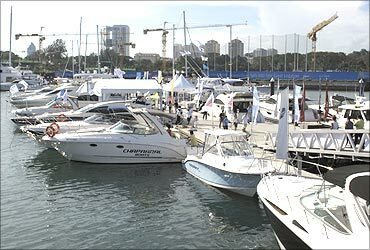 Image: Boats are seen docked during the Boat Asia show in Singapore. 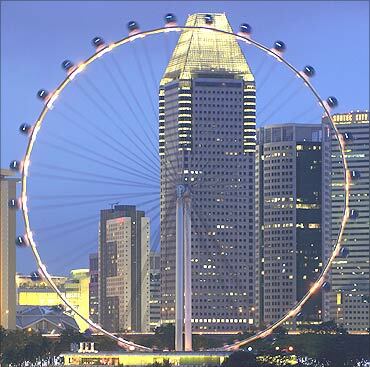 The Singapore Flyer observation wheel. 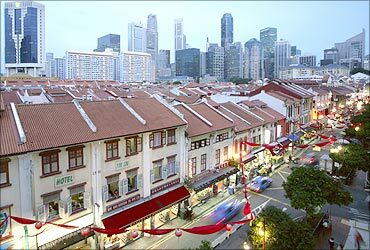 Evening sets over Singapore's Chinatown district. 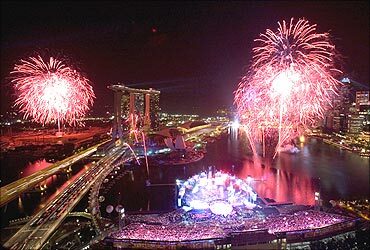 Fireworks explode over the stage during the finale of the closing ceremony for the Singapore 2010 Youth Olympic Games (YOG) at the Marina Bay Floating Platform. 15 SUVs that are setting Indian roads ablaze!